The Elite Program, commonly known as Groom Elite, was founded by Susan O’Hara in 2001. O’Hara owned Thoroughbred racehorses and believed that her horses would perform better and have a better chance of retiring sound if their daily caretakers were provided with horsemanship training. Groom Elite trains racetrack grooms across the country in basic care and handling techniques. As of 2015, 1,965 individuals have been certified by Groom Elite. 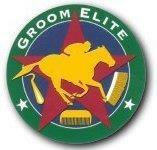 C. Reid McLellan, Ph.D., has been the director of Groom Elite since August 2005. When asked how Groom Elite is unique, he says, “We are the only national certification program for racehorse grooms. Those who are certified in our program are more likely to be hired because their employers can be confident in their knowledge and skills.” Also, Groom Elite instructors become well acquainted with their students and can match them with job opportunities that fit their personalities. In addition to their racetrack initiative, Groom Elite runs a program called Second Chances Groom Elite (SCGE). This program partners with correctional institutions and the Thoroughbred Retirement Foundation to train inmates as grooms. John Carmichael from the South Carolina Department of Corrections and Kip Elser, a Candem, SC, trainer, worked together to bring Thoroughbred Retirement Foundation horses to Wateree Correctional facility in 2004. When Elser saw Dr. McLellan teaching at Colonial Downs, he became interested in Groom Elite as a program for inmates. Wateree graduated its first class in 2006, and five additional Thoroughbred Retirement Foundation Second Chances correctional facilities have implemented Groom Elite as their vocational program. In the past 10 years, 264 inmates have completed the program and received Second Chance’s Groom Elite certification. Correctional institutions involved with SCGE obtain horses from the Thoroughbred Retirement Foundation. In a three-way partnership, these retired Thoroughbreds live on correctional institution property and are cared for by Groom Elite students. These students learn racehorse and show horse grooming techniques, making them more marketable after their sentence is complete. In addition to increasing hireability of inmates, working with horses has a profound impact on the behavior of inmates and decreases their chances of reincarceration.